I'm standing there guarding cattle. Psych! It was an early departure, and the ranger was waiting for us to clear the gate so he could get in with a truckload of maintenance materials, so I just had time to grab a couple quick pictures. That accounts by my shadow in the picture. Anyhow, I chuckle every time I see one of these any more. This is a cattle guard. For those not familiar with them, it is a pit across the drive where a gate would otherwise have to be. It is to keep cattle in a field where they graze free, but where vehicles have to frequently travel without always having to open and close the gate. The pit is covered with a bridge of pipes that have spaces between them. 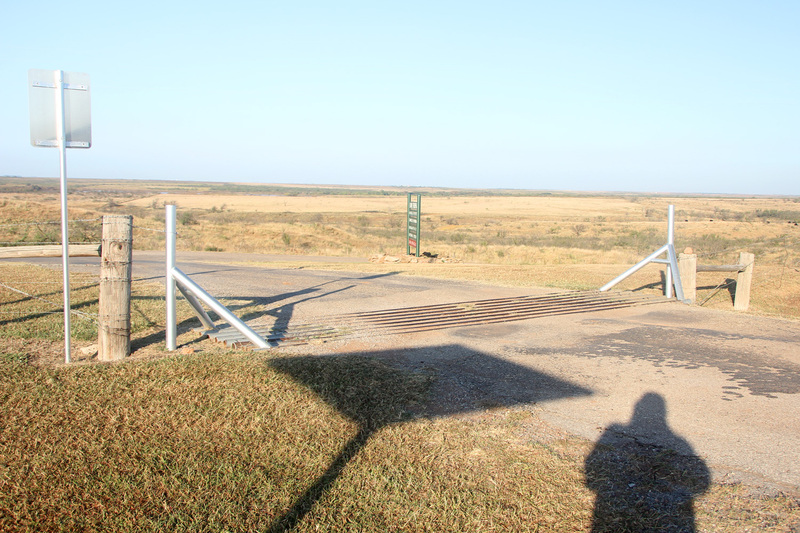 The spaces are narrow enough that a vehicle can drive across them, but wide enough that the cattle fear getting their legs trapped, so they rarely attempt going out of the opening in the fence line. The humor comes from a line budget hearing Pres. George W. Bush was having with the Department of the Interior. They have a lot of open public lands that cattlemen are permitted to use for grazing, but which have to be open to public access, so all the roads have cattle guards in the fences. Pres. Bush saw the line for cattle guards, and wanted to know why the government had to pay men to guard privately owned cattle. Having a farm in Texas, famous for its cattle industry, one would think he would have known what a cattle guard was without having to have it explained, but……oh, well. This is a very nicely preserved steam thresher. Harvesting grain involves three steps: reaping, threshing, and winnowing. Reaping is cutting the grain. Originally, all of this grain would have to be bundled and carried back to the barn. There it was beaten on the threshing floor, which knocked the grain loose from the plants, but a lot of bran, or chaff (broken plant bits), remained mixed with the grain. This had to be winnowed. A basic process would be to throw shovels full of grain into the air. The breeze would carry the chaff and dirt away, and the heavier grain would fall back onto the threshing floor to be bagged. 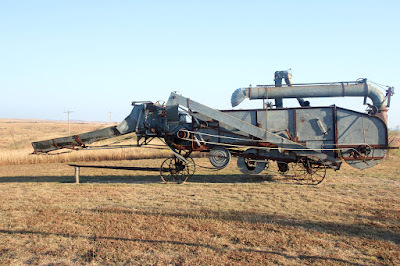 In 1789 a Scottish engineer devised a mechanical thresher that allowed the operations of threshing and winnowing to be done more quickly, but since these were stationary threshers, the grain still had to be carried back to the barn where the thresher was set. 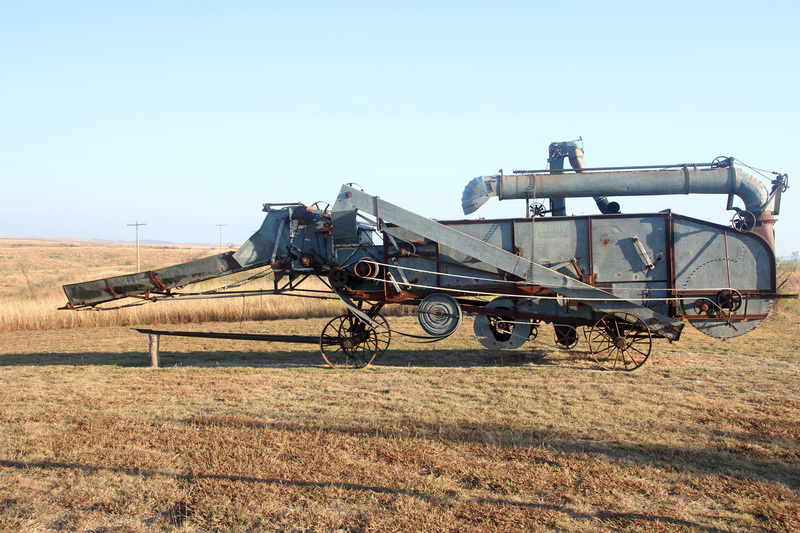 Here is a steam-driven mobile thresher. 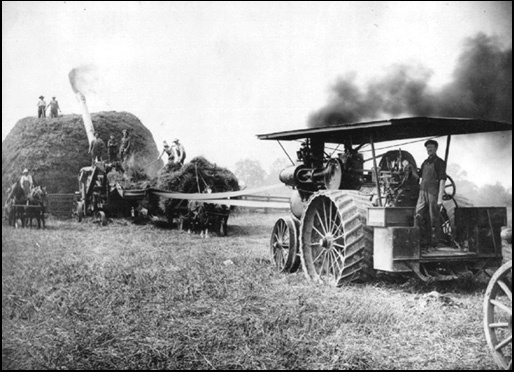 Before gas tractor engines were common, farm machinery was powered by steam engines. The long tongue in front was used to pull the threshing machine into the field with a steam tractor or a team of horses. Allowing threshing to be done right in the field permitted farmers to follow the grain cutting operation through the fields and do the threshing and winnowing on site without having to haul all the grain back to the barn. A steam engine would be set nearby, and long belts, which you can see rolled and carried in a rack on the side of the thresher, were run between a power wheel on the steam engine and the drive wheel on the thresher. Steam engines are extremely dangerous for those inexperienced in their use, and boiler explosions frequently injured and killed farm workers. My father was a fireman on steam locomotives on the Pennsylvania Railroad, so being an expert in steam power, he always had non-stop employment every harvest season. The threshing work is now done by the combine harvester, which is engine powered, and as the name implies, now performs all three harvesting operations simultaneously. A steam engine driving the belts to power a thresher.